Recently, I stepped outside of my comfort zone and went to Mala Sichuan Bistro. They have two locations: the original, which is nestled in Houston’s Chinatown and the Montrose location. I visited their Montrose location. I am a huge fan of all things spicy, so I was looking forward to trying Sichuan for the first time! Upon walking into the bistro, I noticed a beautiful mural painted on the wall, a bar area, and a staircase leading up to their main seating area. I was told that the area was full and that we had the choice to wait; but instead we chose to enjoy the outdoor patio seating. The furniture was crafted from bamboo and hanging patio lights. In addition, live bamboo plants lined the patio which created a beautiful atmosphere! The waitress that came to take our order was very friendly and accommodating. I asked for an Austin Eastciders Texas Honey Cider and was rewarded with an amazingly refreshing brew that perfectly complemented the spicy food we were about to order. First up was the Dry Pot Beef. This dish was amazingly spicy and absolutely delicious! 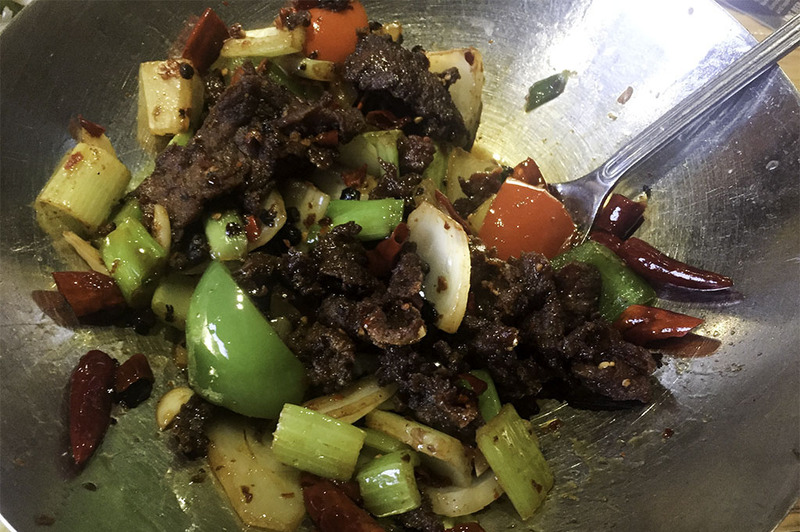 The beef is plated with powerful flavors that are mixed with onions, bell peppers, celery, green onions, and dry red chilies. Believe me when I say that this dish was SPICY! The spices were absorbed right into the beef and was tingling with every bite. I am someone who really enjoys spicy food, so I was in heaven! If you love your meals as spicy as I do, then this is what I would recommend. Next, my fiancé ordered the Aromatic and Spicy Chicken. This dark meat chicken is battered, deep fried, and flash fried with dry red chilies. The chicken absorbed the flavor of the chilies just enough to capture the flavor without being too spicy. If you want to add that extra kick, add some of the crushed chilies and cilantro to each bite. In addition, we ordered a plate of Fried Rice with beef, chicken, shrimp, and egg. Typically, when you order fried rice at a restaurant, you know what to expect. But here, my expectations were pleasantly exceeded! The rice was cooked perfectly as were the meats, egg, and green onions. The ingredients blended together to create a perfect plate! I would go so far as to say this is the best fried rice I have ever eaten. I would come back for the fried rice alone! When we placed our order, our waitress asked us if we would be interested in ordering one of their slices of crepe cake. She let us know that they run out quickly and if we wanted to order one we should do so now. We decided that we would and ordered the Tiramisu Crepe Cake. I often have cravings for it! 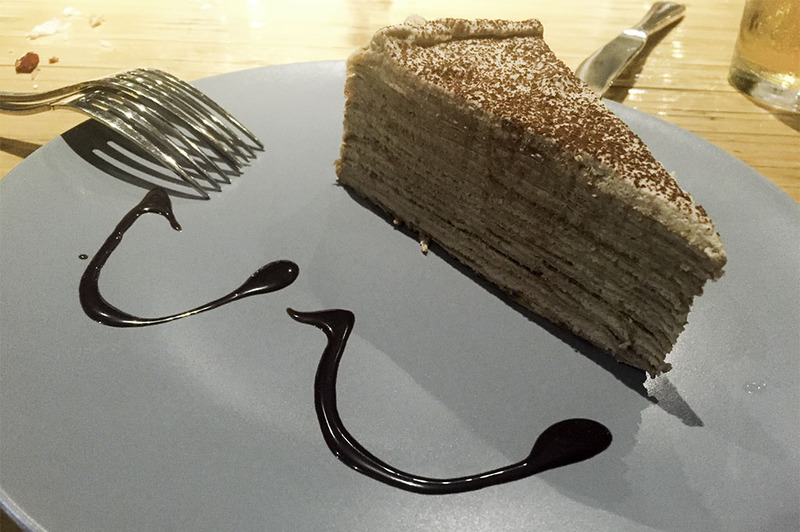 This crepe cake was perfectly moist and tasted exactly like an authentic tiramisu. Don’t let the “I don’t think I will have room for dessert after I eat my food” thought consume you on this one. Trust me. If you’re in the area (or not!) of either one of Mala Sichuan Bistros locations; do yourself a favor and give it a try. You will be back!